Sometimes whammies happen. I have an entire box full of them – copies of Nivmagus Elemental, Scion of Vhitu-Ghazi and a bunch of Deadbridge Chants I didn’t unload quickly enough. A whammy isn’t a spec that will never make you any money, it’s just a spec that is going to take much longer to pay off in the long-term. Sometimes your spec gets reprinted, making it an even longer-term spec (The reprinting of Seance means that one won’t pay off until the coming nuclear apocalypse forces us to use bulk rares as money, luckily I already broke even) but there is always a chance your spec will pay off eventually. 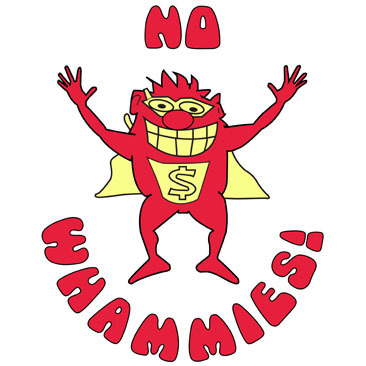 I’m not here to talk about whammies, though, because I think there is a class of card that’s always going to be an eventual hit. 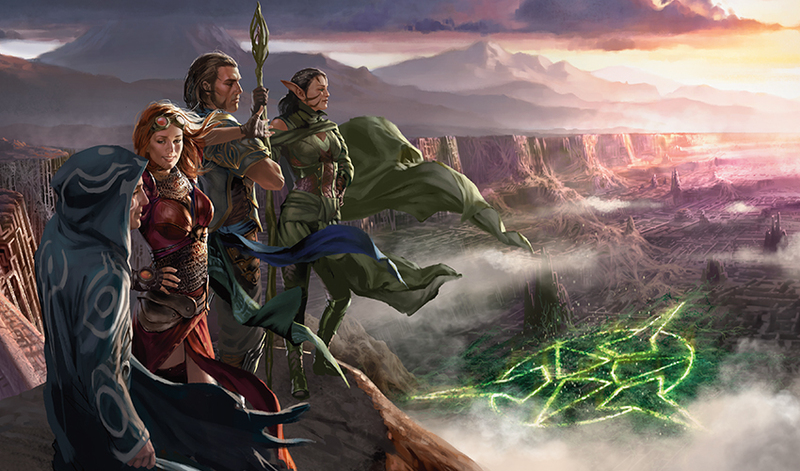 While meta choices fall in and out of favor based on the changing tastes of players, one thing will never change – EDH players are always going to like big mana and the spells that let them get that big mana. The good thing about mana is that it never goes out of style, functional reprints just let players build redundancy rather than cause obsolescence and it appears durdly enough to spikey players that they give it up for nothing. Cards that seem too slow, symmetrical or goofy for Standard will always be undervalued. 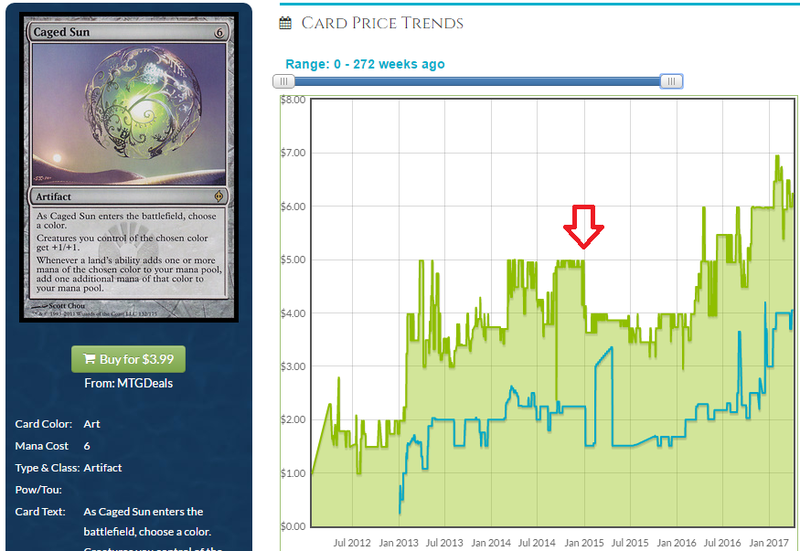 And while functional reprints don’t bring prices down, actual reprints don’t even do it, either. Observe. Want to know what that red arrow indicates? That’s Caged Sun’s reprinting in Commander 2014. 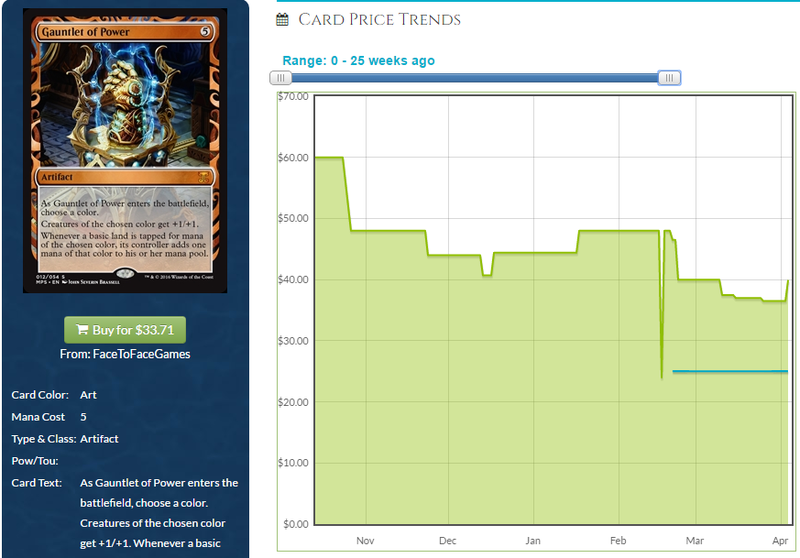 Not only did Caged Sun recover, it exceeded its previous price. This buffs creatures, too, but let’s not ignore the fact that this card is primarily included in decks to double your mana from certain sources and let you do dumb, Timmy stuff. Considering this comes down at 6 mana, you already have quite a bit of mana to work with so imagine what you’re doing now that you’re tapping for extra. This card recovered very nicely and it got me thinking about the future of other big mana cards. 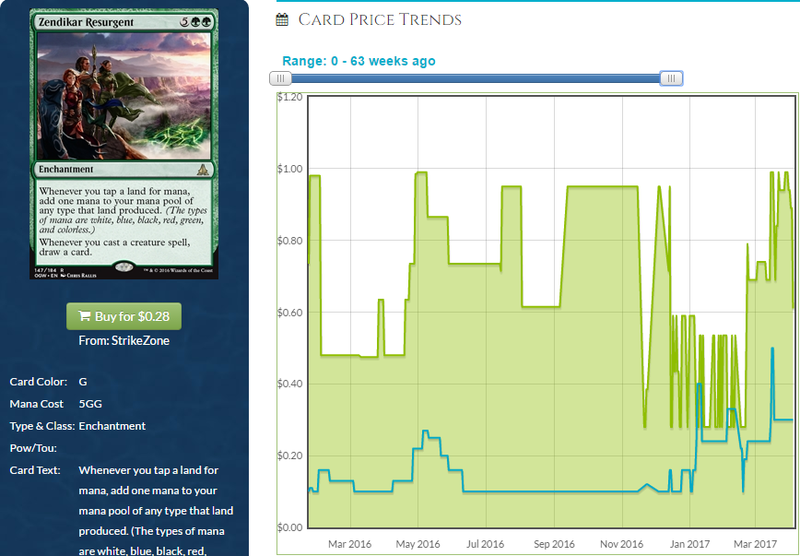 The non-foil card continues to grow while the Masterpiece appears to be sinking, approaching the price of the regular set foil which is itself kind of stagnant. 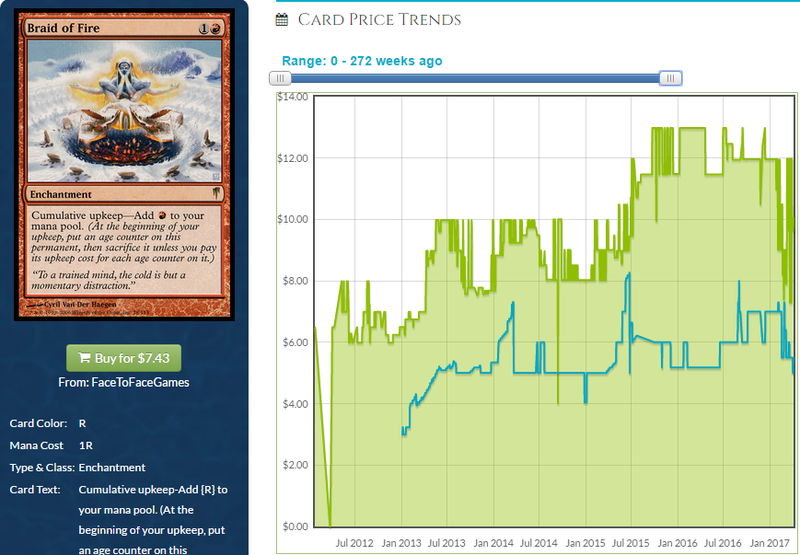 This seems pretty consistent with EDH players generally being less excited by foils than everyone thinks. The Masterpiece, however, I think shouldn’t be on parity with the set foil and the closer it gets, the juicier it looks as a buy-in. Gauntlet of Power is another Caged Sun and while it’s silly to pay $40 for it, I think that’s exactly what people will do in a year, and probably $50. The cheaper the Masterpiece gets, the more I like it. That’s not really the sexiest card I thought of when I started thinking about big mana, though. This card piqued my interest in particular when I started diving into stuff. I’ll admit it took me writing a fake article on April Fool’s Day to remember I hadn’t checked this price in a minute and I’m left to conclude others are sleeping on this as well. In general, red mana is the least desirable of all of the manas in EDH but that’s no excuse for this card to not continue its precipitous growth into the next few years. Coldsnap is criminally under-opened and accordingly, desirable cards from the set, especially ones that are tougher to reprint, are doing very well. Was it the release of Breya or was it me gently reminding people that caused Arcum Daggson to spike? I know which I think is more likely but if you want to say I did it and made you all a lot of money, I accept your praise and offers to hoist me onto your shoulders. 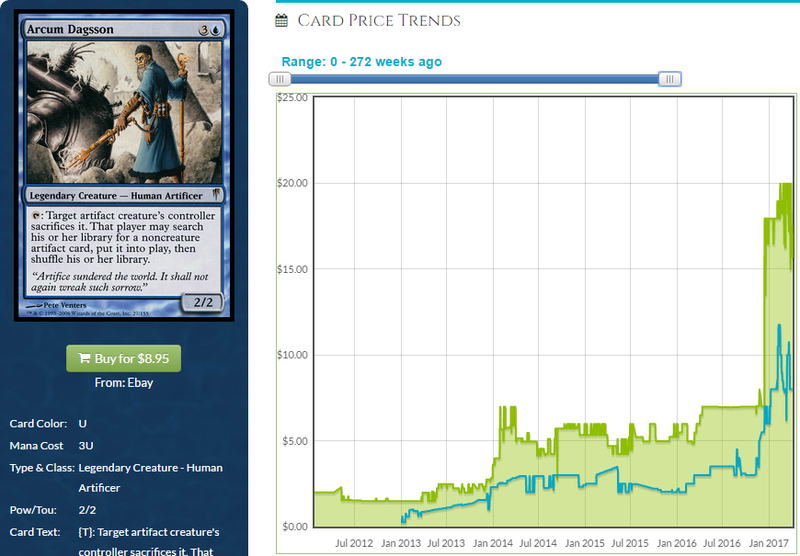 This is the kind of growth that can happen overnight when a ton of people suddenly remember that a card exists and that it’s super busted all of a sudden. Printing Breya and Paradox Engine on top of each other was a best case scenario for this card and anyone who bought in at $5 was probably stoked. Braid of Fire could hit $20 if there is a reason to need red mana or if we just wait for a while. There aren’t too many places they’ll be inclined to reprint a card with Cumulative Upkeep, especially since the power level of the card used to be tempered by your tendency to get scorched by Braid if you couldn’t find an outlet for the mana which isn’t a thing anymore. If you get in now, you’ll be in a position to sell into the hype of a spike or in a position to just ship for the new high price in a year or two. 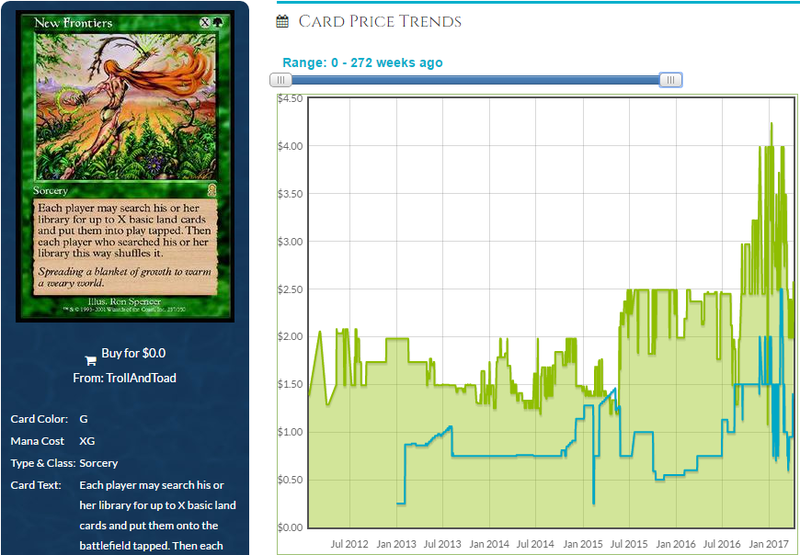 Braid of Fire is in a set where we have a $50 uncommon. 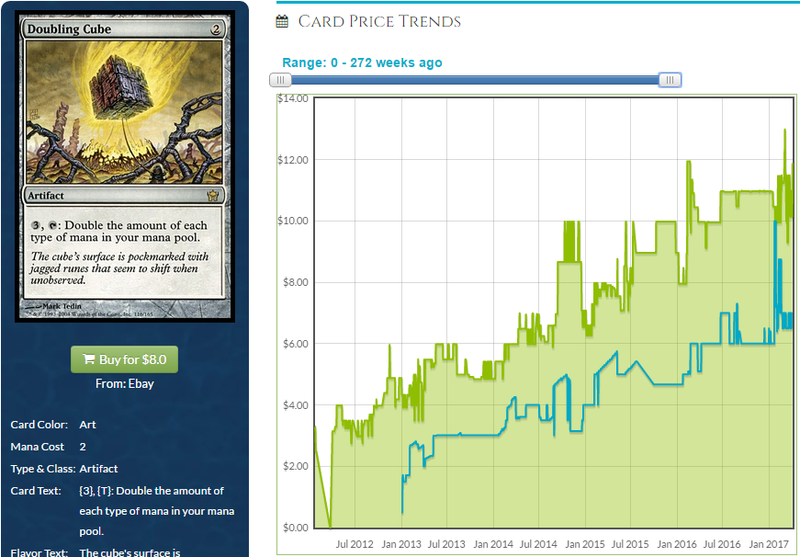 Modern demand is currently much greater than EDH demand, and every deck with Bauble needs 4 compared to every deck with Braid needing one, but that just means $20 is reasonable on Braid and if you buy in under $10, you’ll be more than pleased with those gains. This was part to remind people that this card exists and part to tell people I see a card that has age counters (that you can double, though not with Atraxa, usually) that accumulate and give you mana being useful in EDH forever and being pricier than it is now down the line. Doubling Cube doubles the mana in your mana pool, which, if you’re counting, is exactly twice as much mana as was there before. This is the kind of math that appeals to people who build decks like Hydra tribal. People build Hydra tribal decks, by the way. They’re like vegans about it – I had a guy tell me, at a comedy show at a bar, that he was building a Hydra tribal deck within literally 90 seconds of meeting me. Hydra tribal players want to cast big Hydras and this card helps accomplish that aim. It’s already going up and all it takes is someone reminding people that this is a card. Remember, someone sees a Magic card for the first time every day. There is someone out there that has never seen this card before. They’re going to find out about it today. I mean, statistically. Anyway, have these cards when other people want to buy them, that’s what I’m saying. This is a card that does serious work. You clear the rest of the basics out of your deck, usually, giving you smooth draws. It also gives you hella landfall triggers. This is quietly going up to $5 and those of us who bought a ton at under $1 are gleefully watching it climb. There is moderate reprint risk which is why I’m not deeper on this card, but fortune favors the bold among you and there is still some juice to be wrung from the pulp of this pick before we’re done. Even at $3 this card is a great pickup and anyone who has ever resolved this spell will tell you the impact it has. You have to play more basics than you might normally, but that’s cool. With land about to matter more now that we have cycling lands that tap for 2 colors which has caused people to remember Life from the Loam, Crucible of Worlds and Splendid Reclamation are cards, Boundless Realms is going along for the ride. It gives you a basic for each land you control, not each basic, meaning you can really pull every basic out of your deck on turn 6 or 7, usually, especially if you have been playing spells like Cultivate to ramp up to this point. In a similar vein, New Frontiers is also rewarding players for having basics by letting them strip all of them out of their deck. This lets your opponent do it, too, but you’re set up to play this card which means you will likely benefit from it more and you will also have enough basics to not fail to find a bunch like they will. This is on its way up and gets a little boost every time someone remembers it’s a card. This is symmetrical, however, which is why it’s as cheap as it is. EDH players tend to like cards that are asymmetrical which leads me to my last pick. This is not an “if” this is a “when” and while we don’t know when when is, we know it’s bound to happen. This card is part personal mana flare, part Lifecrafter’s Bestiary. It costs a lot of mana to get it into play, but so does Caged Sun. While this isn’t as ubiquitous as Sun due to its inability to be played outside of green, the color that needs the least help with mana ramping, I still know that this card has legs and while it will take a minute for EDH demand to soak the huge number of loose copies out there, it will happen. This card is too good not to go up. It does so very many things you want a card to do and does them unfairly. Unlike with Heartbeat of Spring, your opponent gets no extra mana and unlike the formats where Heartbeat of Spring is mainly being played, you don’t need to cast this on 4 mana symmetrically because you wouldn’t live to see 7 mana. You can be a cheater and play this as a personal mana pump, and that’s pretty rad. 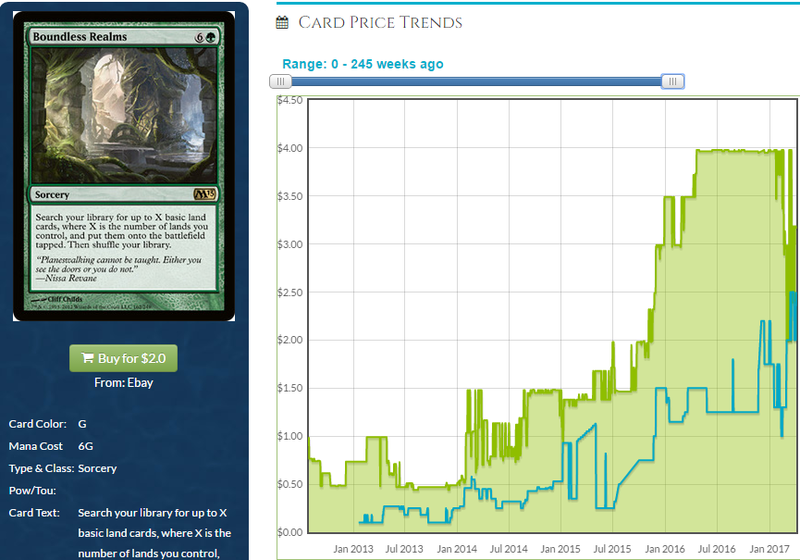 Foils are already $3.50 which is a nice, 5x multiplier meaning EDH players are already very aware of this card. Be aware of this, yourself. That does it for me this week. I’m sorry about the prank article on Saturday, but, no I’m not. If I got you for even a second, it was all worth it. The best part of it was, I took it seriously and wrote it up like it was a real spike that I was trying to decode and ended up remembering Braid of Fire was a thing and that got me thinking about what to write this article about. I don’t know what it all means, but I do know why kids love the taste of Cinnamon Toast Crunch. I’ll tell you why next week. Until then!